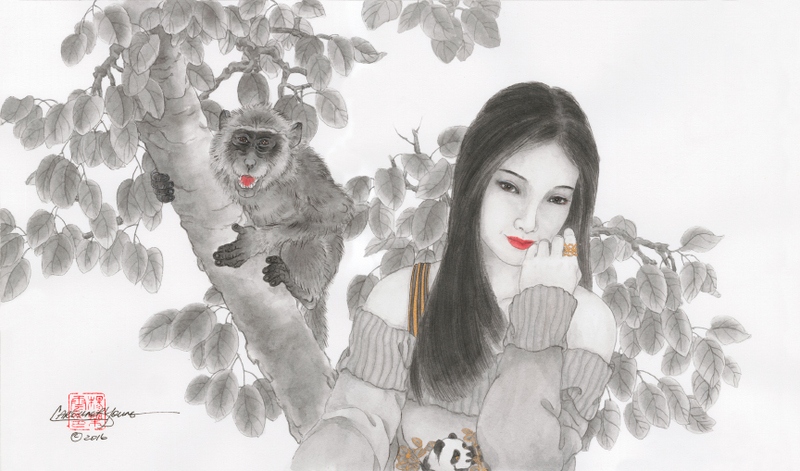 AFA Las Vegas presents a group show to usher in the Chinese New Year For 2016: the year of the Red Fire Monkey. The show will feature local, national, and international artists all inspired by their interpretations of the red fire monkey. The artists included in this show of fifty works are collectively inspired by the clever, witty and inventive sensibilities of the Fire Monkey. Each artist expresses his or her unique vision through a collection of original paintings or drawings. The collective works in this exhibition ask the viewer to embrace irrepressible desires and dare to manifest the creative inventions of the mind into the physical world. The Fire Monkey dares to be different, as do the painters in this exhibition; they strive to paint with exuberance and reveal the curiosities born from their fantasies. The Fire Monkey’s “See No Evil” optimism and the lucky color red converge, in this most auspicious year, when dreams will be realized. This is a year of action, ambition, and adventure in a moment when the reward for the optimism will be revealed in good fortune. Red is symbolic of “The Hearts Desire” and represents the fire that enlivens passion, luck and love.